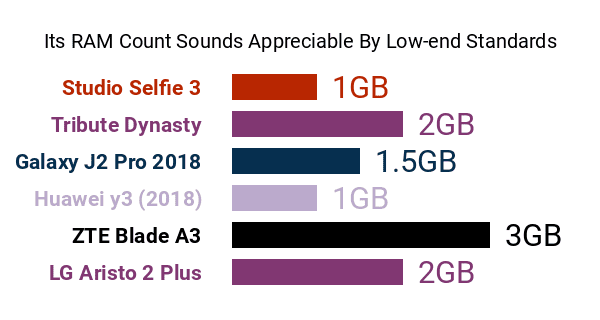 Not only does the LG Aristo 2 Plus look just like its base model, it also shares most of its pros and cons, still suffering from drawbacks like a mere 32GB maximum external memory support , despite coming with an appreciable (by 2018 low-end measures) 16GB internal memory . Additionally, it does not upgrade the Aristo 2's middling 2410mAh battery capacity -- a few similarly-specked budget smartphones pack roughly 2800mAh of raw power. If you're into full-blown heavy-duty phones, however, look no further than this Phonerated list of the best big-battery phones. Camera-wise, the Aristo 2 Plus brings back its sibling's 5-megapixel-only selfie camera . That said, it still comes with LG's Selfie Light screen flash function as well as signature LG-branded pros like Gesture Shot and Auto Shot, making the forenamed front cam a tad easier to digest. Its selfie cam also delivers the phone's user facial recognition system , which, in conjunction with a rear-mounted fingerprint detector, gives the Aristo 2 Plus a slight advantage versus several other entry-level contenders. This Plus edition is also no different from its base model in terms of its primary camera, still rocking a 13-megapixel PDAF-rigged (phase-detection autofocus) rear cam that was rather favorable, coming from a low-budget Android, at least as of this specs-driven review. It features an HDR Mode, Cheese Shutter, and a typical FHD (1920 x 1080) maximum video-recording resolution. Where the Aristo 2 and this Plus version (both are carried by T-Mobile) do differ is in terms of their 4G network capabilities. While the plain Aristo 2 supports only up to LTE Band 66, this Plus model supports T-Mobile's 600MHz LTE Band 71 , making it one of the fastest 4G-enabled phones in its price group -- discover the newest 4G-ready phones here. The Aristo 2 Plus is fitted with a passable 5-inch HD-720p In-Cell IPS display, underneath which runs a modest Qualcomm Snapdragon 425 quad-core 1.4GHz processor that's at least accompanied by 2GB of RAM -- some comparable models stick to discouraging 1GB-only RAMs. It runs Android 7.1.2 Nougat out of the box and, as usual for an entry-level Android, is only offered in one color -- Moroccan Blue. So, given its pros and cons, this Plus edition of the LG Aristo 2 is obviously a relatively cheap ticket into 4G web browsing that also has some perks on the security and imaging fronts.